Bed Frame and Mattress Deals. 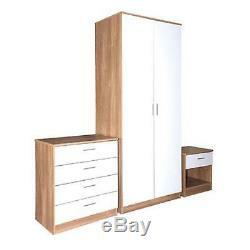 Oak & White Gloss Bedroom Furniture 3 Piece Trio Set Wardrobe, Chest & Bedside. OAK & WHITE GLOSS BEDROOM 3 PIECE FURNITURE SET. 2 DOOR WARDROBE, 4 DRAWER CHEST & 1 DRAWER BEDSIDE TABLE. The white Gloss against the OAK gives a modern, stylish look to any contemporary bedroom. As well as offering you all the storage space you need, its clean, modern design and attention grabbing high gloss finish brings a real touch of sophistication and style to your bedroom. The drawer and door handles are metal giving you even more of that desirable look. This listing advertises our Trio Set, this includes the 2 door wardrobe, the 4 drawer chest and the bedside table. These items are also available individually from the drop down menu above. The wardrobe has a shelf and a hanging rail. See our other listing for the 4 piece set. (includes 2 bedside tables), or our special offer 5 piece set, which includes our very popular Black Prado bed frame. These items come flat packed for simple home assembly, all tools and instructions included. To ensure your new furniture is suitable for your home, please remember to measure your available space before ordering. WARDROBE DIMENSIONS : H181cm x W76cm x D47cm. 4 DRAWER CHEST DIMENSIONS : H69cm x W60cm x D40cm. BEDSIDE TABLE DIMENSIONS: H46cm x W45cm x D35cm. All your bedroom furniture needs in one listing. PLEASE BE ADVISED THAT ALL DIMENSIONS ARE APPROXIMATE, PLEASE ALLOW ROOM FOR SLIGHT VARIATIONS. Over the past few years we have been developing our range of products to enable us to supply consumers with furniture at the absolutely lowest prices possible. We do not have the large overheads that shops and large retail chains have so we can keep our prices low and pass all the savings onto our customers. Cloud Nine Furniture prides itself on its excellent prices and customer service. We invite you to look at our products and pricing and compare them with any other website or shop. We don't believe that you will find a better deal anywhere else which is why we are not able to offer discounts on multiple items. See our terms and conditions for details. All prices include VAT - Registration Number GB166779256. We cannot process telephone payments. The office is closed at weekends and bank holidays. We only deliver to the UK. Unfortunately we are UNABLE to give more specific time slots. Messages sent on Fridays/Weekends will be responded to on Mondays (Bank Holiday exceptions). Please do not send DUPLICATE messages as this duplicates our work and adds to the message response time. All messages are responded to in time and date order, thank you for your patience. Please note the courier drivers are not insured to carry items upstairs/into a property. We are unable to compensate for delayed deliveries. This listing is currently undergoing maintenance, we apologise for any inconvenience caused. The item "Oak & White Gloss Bedroom Furniture 3 Piece Trio Set Wardrobe, Chest & Bedside" is in sale since Thursday, June 19, 2014. This item is in the category "Home, Furniture & DIY\Furniture\Bedroom Furniture Sets". The seller is "cloud_nine_furniture" and is located in Bridgwater.